'The Fruit and Nut Village' Plums and damsons, apples and blackberries, mouthwatering delights mostly hidden amongst the slow rolling tide of bramble amidst forgotten riverside pasture. 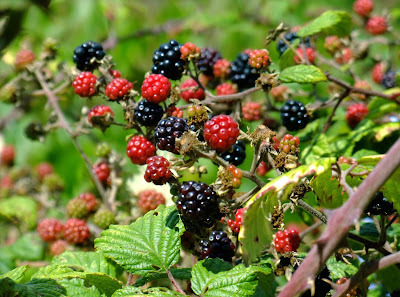 The bramble is pervasive and laden this year with plump, ripe pickings feasted upon and collected in punnets for home consumption, although pick one eat two seems to be the method most favoured. There's a continuing interest for food growing nearby, especially fruits, in a city well known for its gardens, parks and allotments; and a somewhat neglected parcel, partly known as Ten Acres together with its east-of-river neighbouring land of no particular name these days, is mostly traversed by speeding cyclist, striding greenway commuter, meandering dog walker and tottering youngster or elder, generally paying no attention left or right. 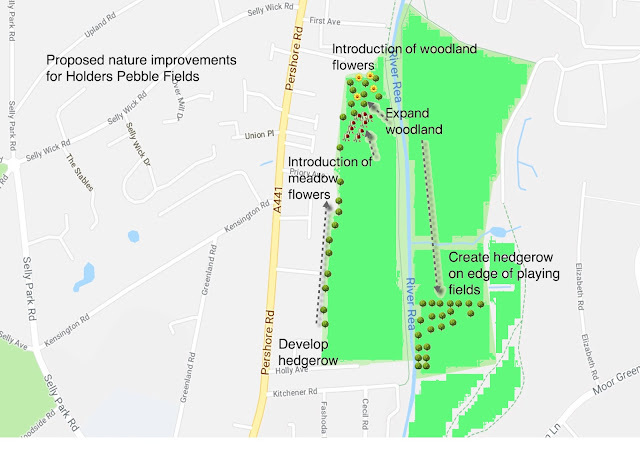 The woodlands are active again with leaf burst and birdsong heralding a new year, although at Holders Woods 'Down To Earth' it never ceases or even slows down, with up to 80 people gathering every Monday morning. All ages enjoy the setting, the social connectivity, the activities and the wonderful cohesive mix of families from Birmingham and beyond. There's always a buoyant and jubilant interest in woodland, and whilst standing-talking amongst the lofty Oaks and Beeches at Holders, a spiritual connection often arises as we look skyward, impressed by the dimensional heights and the cathedral-like perpendicular architecture, which has held humans captivated for a hundred thousands years and more. It's a primitive 'down to earth' moment of reflection marrying thoughts of our existence through time, spacial distance, heritage and the present. Chapter IV A hedgehog's view "The Ladies paraded in their finery during a mid April morn, shrouding the Lords in protective fashion. Whilst Jack was nearby somewhat removed from the hedge but sheltered under Hawthorn with peeping greenery, and with an overview of endless visitors, not quite ready but getting there by verdant repose. "And a fine morning to you too", Dandi and Willowherb. Hazel with Chives and Parsley are doing fine alongside Coltsfoot and Comfrey, all someone prostrate and dwafed by Sycamore and Ash in a combined yet not-too-well-thoughtout encounter. Reluctantly, Wood Pigeon cooed some sort of encouragement and had done so since dawn, by which time Song Thrush had serenaded the new day. Wildlife on your doorstep - The Rea Valley is blessed, and so are those walking it. You don't have to travel great distances to appreciate wildlife, and if you're lucky enough to be in a striking line of a river or other water body then you are truly blessed. Birmingham might not be known for its great water courses but it can boast a fine network of canals and dynamic, vibrant rivers, brooks, streams, rills and runnels, together with reservoirs, lakes, ponds and pools, not to mention wet grasslands and woodlands alongside. 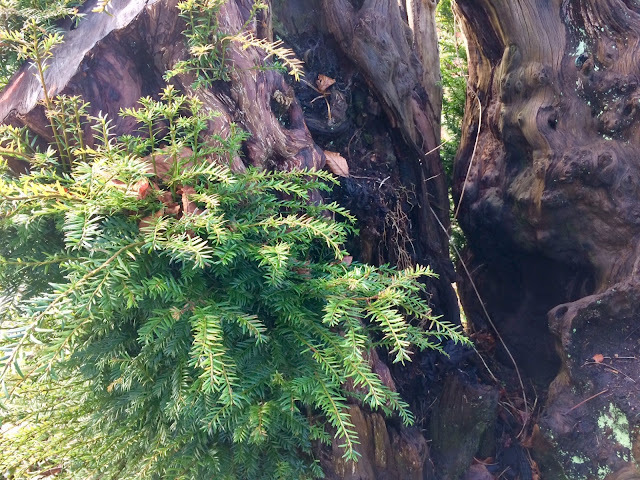 Following the alarming cut back of an ancient Yew tree in March 2015, I'm please to report that two years of healthy looking regrowth to this ancient specimen, reported by specialists to be around 850 years old, provides great hope and blessed relief that the tree has not only survived the ordeal but should continue to thrive and live on for many more centuries. 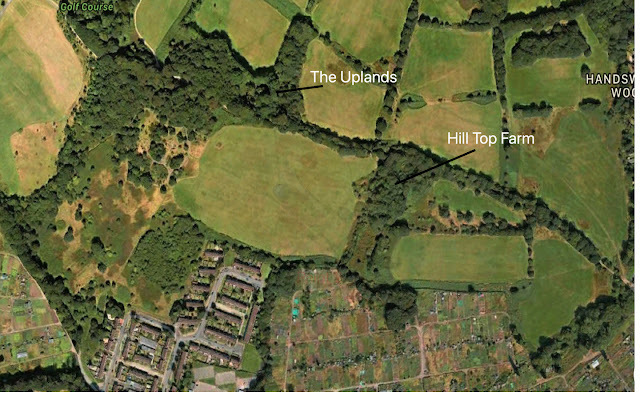 Hill Top, at the western edge of Birmingham, bordering the Sandwell Valley Country Park. An intriguing and ancient broad green lane runs SE to NW, passing the old farmsteads of 'Hill Top' and 'The Uplands'. From the 1890's map below it looks as if The Uplands is a landscaped estate with an avenue of trees laid out to the north of the house. A much larger building than nearby Hill Top Farm and complete with stables and other out buildings. 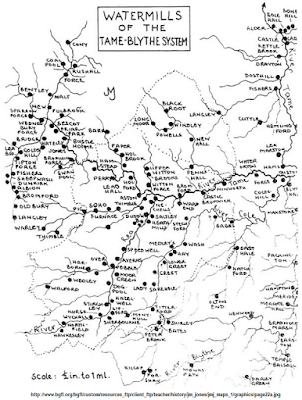 A wonderful and essentially green expanse of unwritten and untold history, crossed and crossed again, north south east west and grazed for centuries.